I hope this can help you, I have searched many places to find out how this was done, but the answer from everyone I asked was the same “I can help you but the cost is 1000 AED” Don´t pay that kind of money, it is so easy to do, just remember to bring cash money. I must say when i decided to do this myself, I was expecting the worst, but it was so easy, and all the people were helpful and friendly. There was even a guy there, in the waiting area, who gave everyone fresh water, and there was free wifi, what more can you expect ? Proceed to the Fujairah Traffic Department with the above mentioned documents, the procedure is the same for all Emirates. Written by Kristian Kongstad Holm – Dubai 2014. I moved to Dubai in 2013 and I’d like to share with all of you the best experiences, where to stay, where to go clubbing, where to dine, what to see, how to do business, tips and tricks and the upsides and downsides of Dubai that I have experienced so far. My experiences have been made on holidays, business trips and now living in Dubai, so whether you are planning holidays or you are thinking about moving here, I have put together a good sample of tips that you might find useful. First I’d like to start whit at little good-to-know for residents as well as vacationers. -First of all, and this is mostly to residents, in Dubai there is no tax and VAT!! First and primarily reason to live here. 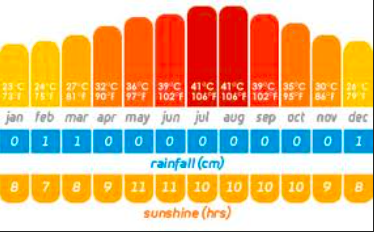 -Next is WEATHER, Dubai has approximately 320 days with sun a beautiful weather. -Third is living in a country were main language is English. -Fourth is living in a country were 80 % of the population are Expats, is gives you a feeling that everyone is in it together. It units people in a very good way. -Fifth is the felling of living in a business city, and it really is! because you can only live in UAE – Dubai, if you have a work visa unless you are born here. But please mind! – it can be highly addictive. Good tips before you travel into Dubai. In Dubai it is not normal to drink alcohol because of there religion, but Dubai is dependent on their tourists so they have made many compromises, in hotels and restaurants ‘belonging’ or nearby hotels, they serve alcohol etc. If you are a resident you can get a license to buy alcohol and a tip for residents as well as vacationers, you can per person bring 4 liters of alcohol into Dubai every time you arrive at the airport. Pork is only served in a few five star hotel restaurants or buyable in supermarkets – normally – but there are ways to get around that, see my ‘Shopping’ section. Finally and this is a downside seen from lover’s perspective, you cannot show physically attraction in public areas in Dubai. No kissing, hugging or holding hands, if you are a tourist they normally overlook it, because they see you as an ‘ignorant tourist’ but if you are a resident, you will be punished for it if anyone sees. When you go out, remember to wear proper clothes. It is frowned upon to wear small skirts and tops. Some places are stricter than others. If you go visit a mosque, wear clothes that cover your knees up to the neck and shoulders, as well as when you go to a mall, the same is required. If you go to and from the beach it is not necessary. If you just make sure to consider your surroundings, not to offend anyone then you’ll be fine. Where to stay: House, Apartment, Hotel and ? A one bedroom apartment located 30-40 km outside the midtown is per month around 4000 AED. A beautiful 1 one bedroom in Dubai Marina or downtown is per month 8.000-12.000 AED. If you find an apartment in the Marina you will most definitely have a view over the ocean or the Marina. Best place to live, in my opinion. If you are on holidays for a shorter period 10-14 days, I would recommend that you stay in one of the big hotels, where the hotel is an experience in itself. If you wish a more price friendly holiday, where you experience some of the local society, as I prefer, I would recommend you to rent an apartment or a villa. An apartment with 2 bedrooms is about 500-800 AED per day in Dubai Marina. If you decide to stay in a villa or an apartment further outside the city there is the train RTA that combines all of Dubai very good. Here are some links to of were to find apartments and Villas in Dubai. Hotels I have stayed at in Dubai that I can recommend. All of the hotels listet below have minimum 4 stars. ‘ Atlantis – The Palm is in my experience the best hotel for families with children. ‘ Kempimski – The Palm a romantic getaway, but with plenty of Russians. ‘ Jumeirah Beach Residence – Jumeirah, fantastic for children and has great sports facilities as well as dining. Jumeirah Madinat – Jumeirah, a very romantic place, with nice restaurants. Dubai has several areas and they are not all in the same reach. I have chosen my favorite places where I have used most of my time since I’ve moved here. 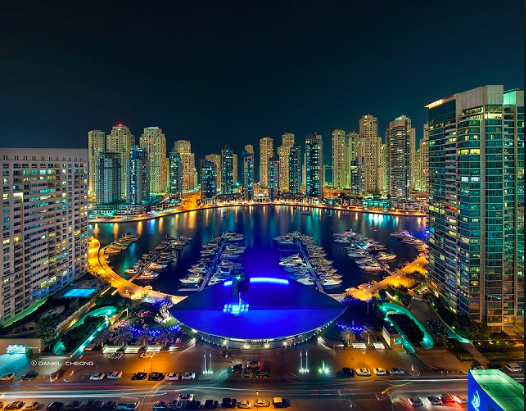 -Dubai Marina, most expats live here, especially young people between 20 and 40 loves this area. – JBR is close to Dubai Marina, it is a long beach promenade filled with fantastic dining facilities, shops and of course the beautiful beaches. I recommend to spend a bit money to use the facilities on one of the hotels, where you have sunbeds, food, drinks, bath/WC and shade. If you want to use the public beach go after 3 or remember shade, sunscreen and water. Always wear shoes in the sand as it is very hot. 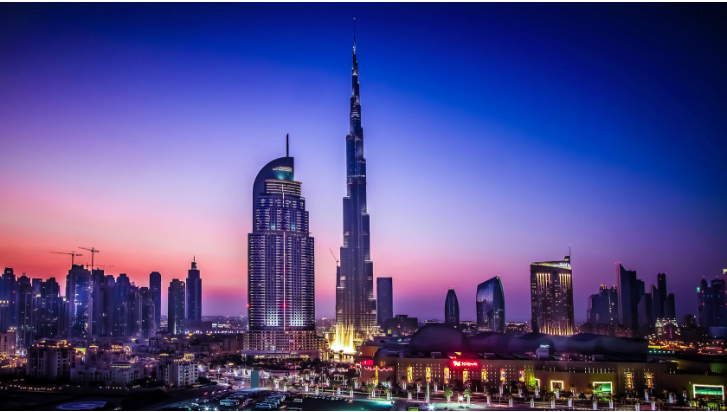 – Dubai Downtown or Dubai International Business Center (DIFC) is the most trendy area with the best restaurants and nightlife, and of course, as the name states, the place for business. 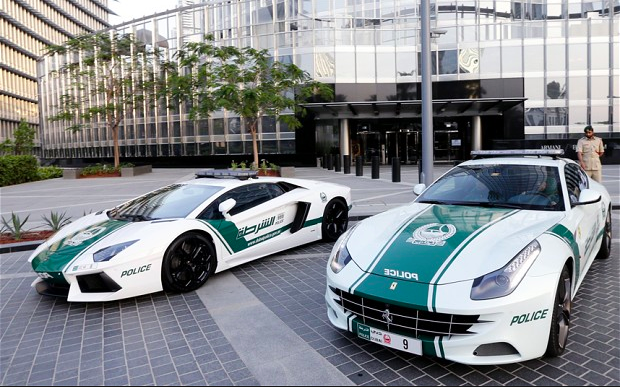 The area is located very close to Dubai Mall. – The Palm is the most exclusive area in Dubai, exclusivety for me includes the voice of the waves, endless white beach, not much noise and the best view which this area contains. Here, most of the 5 star hotels are located and even if you are not staying at one of them you can still use their facilities. As an example, Nasimi Beach at The Atlantis, which I will explain more about in my ‘Restaurats, Clubs and Beaches’ section. – JLT, is mostly an area for offices and business, you can also find apartments here where the prices are near the smallest in Dubai, and still okay close to the Dubai Marina (where it happens). This area is not yet finished, restaurant and stores is nothing special… yet… In my experience, you’ll need a car if you decide to live here. – The Hills, it is mostly Expact families with good income that lives here, it is one of the most exclusive areas in Dubai. Burj Khalifa, the tallest building in the world, take the elevator to the 144. floor and you can put it on your resume, it is spectacular. You can buy tickets on the App ‘At the top’ or in Dubai Mall on Ground Floor with same name. The price is, if you buy it at Dubai Mall 450 AED. If you want the view but isn’t in need of going all the way up, my advice is to go to the 127. floor (for adults only) where you can visit the sky bar. It is free, though you have to spend 200 AED as a man, women are free, which gets you a few cocktails or coffee and cake. 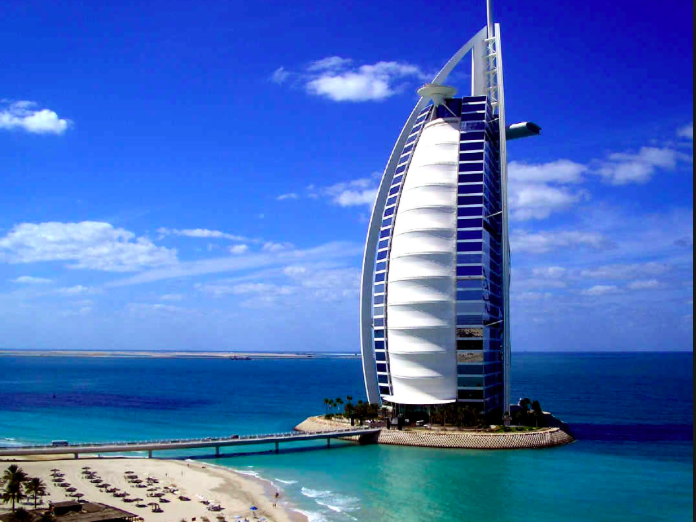 Burj al Arab, better known as The Sail, the worlds only 7 star hotel is an incredible experience. The cheapest way to see this place is to book the afternoon tea between 3 and 5 pm. You’ll get the best cake platter and the absolute view. Are you bringing your children to Dubai, you have to try one of the big water parks. One is in Jumeira Beach Residence. The best in my opinion is at Atlantis at the Palm, the trains go directly to it. And to make a two in one experience you can also visit the aquarium at Atlantis, its free to look at from the outside, but you can also buy tickets to go inside, you will get a discount if you buy the ticket to the water park at the same time. This is one of the places where you can use these very popular vouchers or coupons. If you have a coupon book, like the Entertainer you can make your money worth, because on this coupon for the water park / aquarium you can save 50% which is more than the coupon book costs. Petrol is ridiculously cheap, 85 liters will cost you around 110 AED, 100 for the petrol and 10 for the guy who put it on while you sit and relax, never again petrol smell on your hands. Renting a car in the UAE is very price friendly, and of course it helps even more with the petrol price being so low. Renting a car is a good way to see Dubai, but I recommend, if it’s your first time here, take a taxi. Taxi prices are very low, the meter starts at 3,50 AED and you can take a 30 minute ride for less than 50 AED. The more luxurious way of getting around is taking a limousine, they are white Lexus’ and they are to be found where the normal taxies are, you can also order these limousines with an App called UBER. The price is about 20% more than a normal taxi. The RTA Train is a good way to get around in Dubai, you can locate them from a very far distance as they are made in gold color of course, there are only 2 directions which make it easy to handle, simple commute. Waterbus is also an opportunity. I have experienced them in the Dubai Marina, they make stopovers 4 places in the Marina, they sail every 10 minutes and the price is 2 AED. If you decide to rent a car, take note that they do not always use names of the roads, they use landmarks, names of buildings etc. It can be difficult to get around and if you miss your exit or take a wrong turn, you’ll have to guard yourself with patience. Be aware, exit numbers will mess with your head, if you pass exit 47 the next exit can easily be exit 52, and not 48 as in my opinion would be normal. Also, they drive like maniacs, even after 4 years in the Southern France, driving every day, among French drivers (!! ), it still was a bit of a challenge to me in the beginning. As if the rule is, there are no rules, the biggest and fastest car have majority. Restaurants, Bars & Clubs, Beaches. I would like to underline some of the greatest places I have experienced so far in my time in Dubai. Be aware that you can, in many restaurants smoke inside. I just got uses to the non-smoking politics in many European countries, but here, its still allowed. Especially the Sisha’s is a pain, so be on the looks for those, they mostly appear places with couches and relaxed area. In Dubai Marina, I enjoy the Barasti Beach as restaurant, bar and beach. It is a bar/restaurant/sportsbar/lounge/beach. Plenty of expats come here every night after work. Prices are reasonable and everything is outside, with the amazing view of Dubai Skyline in the back. Buddha Bar in the Marina is also worth a visit. It is a great place to eat and enjoy a couple of drinks, come after nine when the bar gets busy. One of the coolest beach restaurants is Nasimi Beach on the Palm. Nasimi transforms into a huge beach party around 3 pm. Entrance is free but to use the sunbeds you have to spend a minimum of 150 AED in the bar or for lunch. The view over the Dubai Skyline is when the sun starts to go down, fantastic, and the atmosphere is awesome. A new place, I am starting to use quite a bit, is Zero Gravity, it is a mix of beach, business meeting point, lounge, club, sports and restaurant. Zero Gravity is placed in the Dubai Marina in connection to the Dubai Skydive. Every 15 minutes, new skydivers drop down from right above you. Nice surroundings for doing business on the terrace as well as spending the day on the beach. Zuma is placed in the business area and is the most, of my experience, trendy place in Dubai. The bar serves art in a glass and have the absolute best quality of liqueur. The bar is worth experiencing. Then to the dining, this place serves Japanese inspired food. The have good sushi and some of the best meat I have tasted. The wine list is as I would want a wine list to be, a nice selection of wines to a fair price. Bring your friends or business partners here, either way, they nailed it, great experience. Al Qasr – Madinat has the best brunch in Dubai. After paying 550 AED everything you can eat and drink is free including champagne “ad libitum”. Please also visit www.timeoutdubai.com for more reviews and tips. – You will not find a 5th Avenue here, it is simply too hot to be outside most of the year. Instead there are mall’s, and many of them. The two biggest malls, and the two I like the best are Dubai Mall and Mall of The Emirates. -Mall of The Emirates: Aside from the endless shopping opportunities, this mall stands out it has indoor skiing. So put on your skiing gear and enjoy the slope and the cold for a little while. It is a great experience for both children and adults. – Dubai Mall: The newest and biggest mall. And like Mall of The Emirates you’ll of course find all the shopping you need, and also here, there is plenty of other features. You can go ice skating on the Dubai Ice Rank, you can drop the kids of at Kidzania, a kids-country while you go shopping. You can see the waterfall inside the building 3 stories high or you can spend a few hours looking at the aquarium in the middle of the mall. Outside the Dubai Mall is the Dubai Fountain, on both the hour and half-hour you can/shall enjoy the beautiful show they put on. It is a watershow that fills the whole fountain, it is stunning in itself but it also have the greatest background, Burj Khalifa (the highest building in the world) is right next to it. So if you are not into the show, which I highly doubt, then you can admire this great peace of art in the meantime. If you don’t want to stand in the crowd with plenty of other people, the Dubai Mall has numerous of restaurants on the fountain side and on terraces where you can be on the first row. 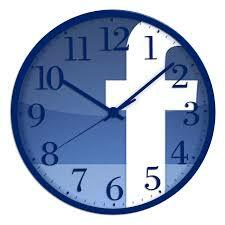 On the hour it is music in English and half-hour it is in Arabic or it is the other way around. When you are at the Dubai Mall you should at the same time take a walk around the fountain, they have made the surroundings very nice. Also you will find restaurants, if you cross the bridge (by foot) where they serve alcohol, as they are a part of a hotel nearby. You will never be done shopping, in any of these malls. In both of the malls, there is great dining, there is the easy ‘foodcourt’ where all McDonalds, Burger Fuel, Subway etc. etc. is and there is the more fancy restaurants, the list is long. The best thing about Dubai Mall is without a doubt the Platinum Cinema Suites, it is a cinema, but it is nothing like a cinema. You sit in comfortable couches; have blankets and pillows, and a little table with a button you can press to get service. A five star experience, which I never get sick of. The price is around 150 AED. – Groceries: There are numerous supermarkets, you have the monstrosities like Carrefour where you can get everything and 100 different kinds of the everything. Then you have the more ‘English’ supermarkets like Spinney’s and Waitrose. Here you’ll have most of the common English products and the most important of all; Pork! There is a Non-Muslim section in both supermarkets where you can find all the pork you need. One of the greater things about Dubai is all the expat life, 80% of people living and working here, are expats. Makes you feel a part of the group right from the beginning. I have been living in Monaco for the past years, and that is still a old-fashioned society ‘work-class’ and ‘upper-class’. Here, everybody works, everybody have an identity through there job, and you need a job in any case, because to get a visa you have to have a job. – What kind of strategy to go with, what kind of company form should you pick ? all these questions I will answer if you send me a email, use the contact form here. – On most hotels, you can for a fee, use their facilities for a day, sunbeds, pool, parasols and all the luxury they have. – Always bargain everyone can give discount. Are you thinking about moving to Dubai, and have questions you’d like answered, don’t hesitate to contact me, I would be honored to help out a fellow expat please do not hesitate to send me a email true my contact form here. Please see my complete guide about Dubai here. I hope you will enjoy Dubai and UAE – as much as I do. Hvorfor er Danskerne så middelmådige? Hvorfor har vi danskere så svært ved at unde andre succes? Man kan tolke Janteloven på tusind forskellige måder, men den symboliserer i bund og grund det samfund vi lever i i Danmark – et gråt samfund efter min mening. Men vi er blot en del af et spil, som vi selv er med til at skabe. Men til hvis fordel er det, hvis man ikke tror, at man er noget, ikke tror man er bedre end andre, eller ikke tror nogen bryder sig om en, hvad godt kan der komme ud af det? Hvorfor er nyheder kun spændende hvis de er negative, ingen andre lande har nyheder som har 81% i gennemsnit negative nyheder! I USA kan de klare sig med 48%. Der er så få mennesker i Danmark, der virkelig står ved dem selv, og bare nyder livets eventyr, og ikke tænker på hvad mon andre tænker? Nu har jeg selv boet i udlandet siden 2009, og hvor er det dog skønt med højt til løftet, succes er noget man bliver rost for, og noget man kan være stolt over, uden at skulle være bange for hvad andre tænker? Da jeg boet i Danmark, tænkte jeg altid når jeg trådte ind i rum med mange mennesker, hvad mon de synes om mig? Idag når jeg træder ind i et rum, tænker jeg mon der er nogen jeg synes godt om? En anden ting som har ændret sig efter jeg flyttet, er opfattelsen af hvad rigdom er? Engang var det penge, idag er rigdom for mig, oplevelser som jeg dele med dem jeg holder af, intet betydet mere for mig. Den følelse ved at give andre oplevelser, har jeg altid elsket, og da jeg drev franchise kæden BilXperten lærte jeg altid vores salgsteam, at hos os sælger vi oplevelser – ikke varer, måske det var en del af succes? Ligeledes sagde jeg altid prøv, at giv kunderne lidt mere end de forventer, folk bliver så glade, og sådanne oplevelser gør kunderne kommer igen. Prøv at tænke over, hvor svært vi har ved at sige ‘tak’, når vi får et kompliment. Hvorfor har vi det? Jeg har lært af en af mine bedste venner gennem mange år, som jeg startet BilXperten sammen med, ros andre, fortæl dem hvor dygtige de er ( og gerne foran andre ), og se dem blomstrer, de begynder at tage ansvar, og sammen skaber i nye uanet succeser. Det er da vidunderligt at få et kompliment. Et kompliment er noget vi altid vil bære med os i vores ‘selvtillids-taske’ – de fleste komplimenter er rent faktisk nogle vi husker for altid, men alligevel tænker vi så stærkt på, at folk ikke må tro vi er selvhøjetidlige, eller har lidt for meget selvtillid. Hvorfor er der så lavt til løftet i Danmark? Hvis man oser af selvtillid og arrogance, så fyldes befolkningen af forargelse over det. Men hvad er problemet? Man generer da for guds skyld ingen – man er derimod et pragteksemplar i min øjne, som måske smitter andre med deres humør og selvtillid. Men Danskerne har så lidt til overs for een, der tør tage chancer – og det er da forfærdeligt! Måske er det også grunden til så få tør starte som iværksætter. Andres succes skal nydes af alle. Det skal give os blod på tanden til at give den dét ekstra, og selv få opfyldt vores mål og drømme – men vi har så travlt med at dømme andre, at vi slet ikke lægger mærke til, at vores egen tid rinder ud. Det er en vidunderlig følelse, at være stolt og tilfreds over hvad end man nu har opnået, og det er da en gave, at vi kan dele det med hinanden. Ikke alle måder falder i alles smag, men vi må da kunne unde folk det – ellers skal spejlet nok vendes mod en selv, så vi kan reflektere over de reelle problemer, som vi selv kæmper med. Ens opfattelse og fordømmelse afspejler udelukkende ens egne behov og problemer, og det er en skam, at vi er så få, der kan se det. Jeg er stolt af mig selv, og synes jeg er en helt fantastisk person, der virkelig vil andre mennesker det godt – og jeg gad godt vide, hvor mange, der får ondt i numsen over den sætning!? En af mine mottoer har altid været – behandle andre som du gerne selv vil behandles. Men mit favorit motto er – Vindere….er tabere – som blot ikke gav op! Godt nytår til jer alle, håber mit indlæg kan give jer inspiration til et nytårs forsæt? It´s NOT just your business website! How your online Reputation is formed? Comments made about your business or you name on social media such as Twitter, Linkedin, Facebook, Google+, a Blog like Blogger or WordPress, a post on a newspapers website, Tumblr etc. Images about your business or you name online like Pinterest etc. Videos about your business or name on Vimeo, Youtube, Facebook, Flickr, metacalfe etc. Articles and posts published online about you or your business. Comments that others make about you online positive or negative are there to stay, and if you don´t control over your online Reputation it may show up on one of the 3 first pages on Google, Bing, Yahoo etc. Please remember that about 80% ( www.pwc.com ) of all people or companies research online about you or you business before doing business with you or your business. 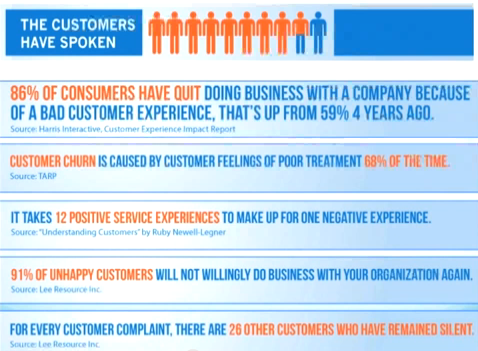 72% of those that research will not do business with you if there´s is a negative comment. 90% of internet users only look at the first page on Google (search engine results) when doing online research. 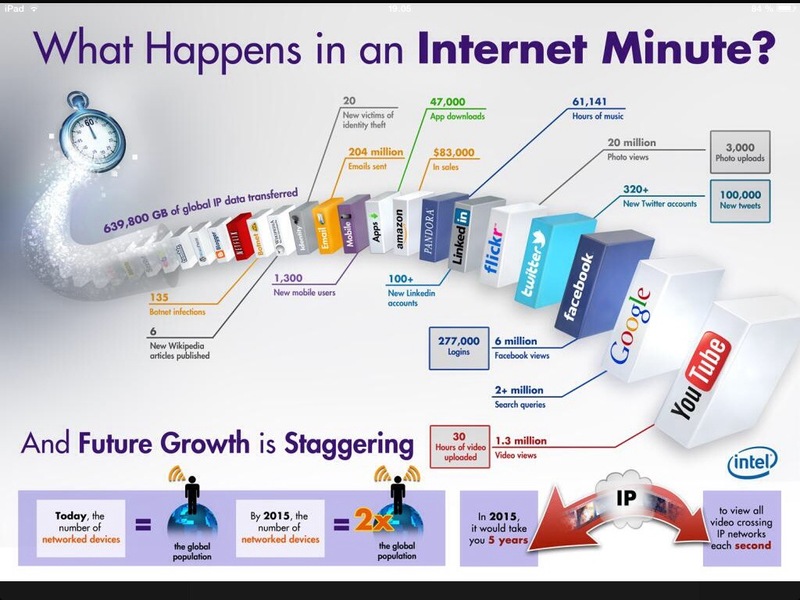 So this is a little like first impressions when you meet new people or business, within 60 sec. you will make a evaluation of the person or business you meet, 80% of this 60 sec. will stay forever in your mind only 20% can be change. So get it right the first time when you meet people, Online or face to face! 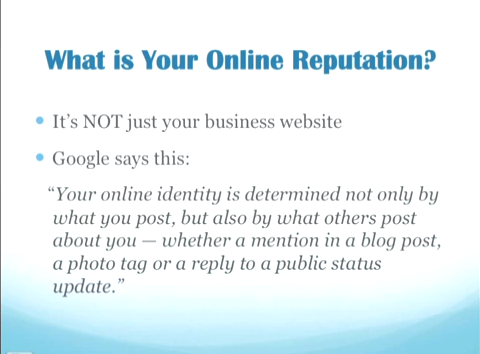 This is why Google+ and Facebook are so importen to you online Reputation. 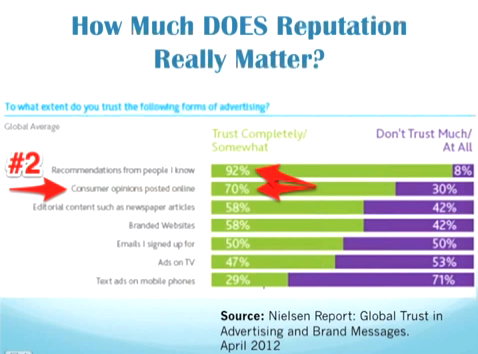 70 % trust Businesses or you if you have minimum 6-10 reviews /articles there are positive. Do you have positive content and reviews past the first page? If so, moving these items to the first page of Google would help your online Reputation. Since more than 95% of searches online don´t go past the forst page, YOU NEED TO OWN THE FIRST PAGE, with positive reviews or quality content as your personal website, Facebook, Google+ and LinkedIn, 1-2 Blogs that links to positive articles or story´s about you or your business. 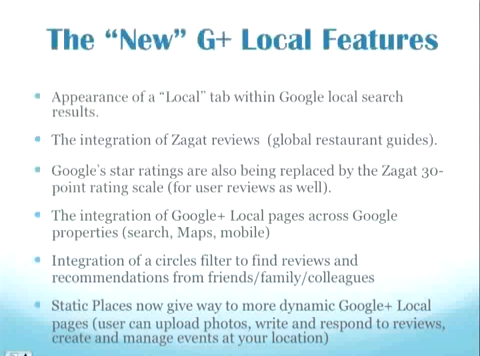 Do a Google search for your Key Word ( business or you name ) + you local city, business type etc. example Audi + 4×4. Check search results and record any directories that come up in the first 3-5 pages. Claim your business or name on these directories using the same info as your Google+ and Facebook page, and optimize your profile with pics, Key Words, address, description, specials etc…. but only good content! Gives you more citation authority. The more times your name or business, address and phone number appears on the web, the higher your listing will rank. Access to new markets, Many people visit these directories who otherwise wouldn´t have been able to connect with you or your business. Company contact info is accurate, ensure all the info about the company or your name is true, accurate and up to date. Ability to respond to bad reviews, by claming your listing, you´ll beable to respond to people´s reviews. And by responding to these reviews, it shows that your care, and that people that write a comment can expect to get a reply, that will make them think twice about making a bad comment. More opportunities to get & post reviews, the more reviews/post you have, the more content is created and SEO loves new content. More content = more authority. Many others sites aggregate review/post/comments so they will appear in many others places on the internet. Always make sure your Google+ and Facebook listing is updated first, then make sure that all the other directories have the exact same company name ( persons name ) address and phone etc. Advertising and Spam, Don´t use reviews/post for advertising or post the same or similar reviews across multiple places, don´t post fake reviews intended to boost or lower ratings, it needs to look natural in Google eyes. If you need a good review/post, ask someone you can trust as on LinkedIn when you Endorse people, ask family and close friends to write good and honest reviews / post about you or your business. Your goal in handling an upset customers or person should be threefold. They turn from upset to satisfied! You learn something about your business that will improve it and help to avoid future negative reviews/post. If the negative comments/post is true….. Participate in the discussion and be honest. Add response to website and social media sites if necessary. Issue statement addressing the problem, addressing what has neen done. If the negative comment is false…. Post a response on your website, social media sites. Find or create positive contant about your business and use search engine optimization to get it of the first page on Google. In the ever changing landscape of social networking, you might be wondering if you are getting the most out of your business’s social engagement design? Here we define social engagement design as the process of gaining website traffic or attention through social media sites. Social engagement design usually center on efforts to create content that attracts attention and encourages readers to share it with their social networks. Company messages, stories, and helpful information spreads from user to user and presumably resonates because it provides relevant, interesting and/or useful information. Hence, this form of marketing is driven by word-of-mouth, meaning it results in earned media rather than paid media. We think of social media as just another marketing channel when we need to instead think of it as the influencer of all channels. We are finding more and more businesses are defining meaningful ways to use social media, even if it isn’t always to sell directly. Web merchants view social media more as a medium to build up brand awareness and customer loyalty than as a way to drive immediate sales, says Internet Retailer reporting on its latest survey of 175 companies that sell online. Survey participants included 85 web-only merchants, 40 consumer brand manufacturers, 34 retail chains and 16 catalog companies. 96 percent say social media campaigns are important to the future of their Internet business; 53 percent label it very important. 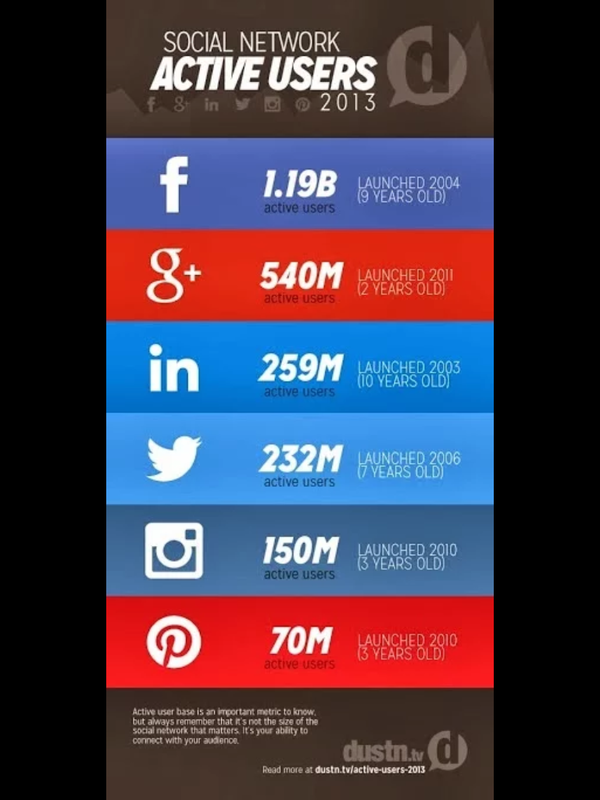 51 percent post videos on YouTube, 9 percent use Google+ and 15 percent leverage Instagram. The more success you have with customer engagement via your social media design, either on-line or off, the better your understanding of their needs and priorities. Having the best customer insights makes it much easier for you to define your next moves and improve your odds of success. Please share a social engagement design experience with this community. Any questions or comments to add below? So what’s the conclusion? The conclusion is there is no conclusion. There is only the next step. And that next step is completely up to you. But believe in the effectiveness of social media and word of mouth marketing. And put it to good use. 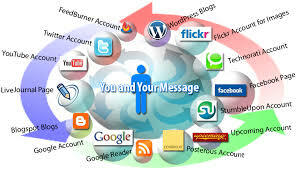 – It’s up to you to keep improving your social media marketing efforts. – All you get is what you bring to the fight. And that fight gets better every day you learn and apply new lessons. – When things go wrong, what’s most important is your next step. – Try. Learn. Improve. Repeat. Are you devoting enough energy improving your advertising? Do you have a lesson about making your advertising better you can share with this community? Have any questions or comments to add in the section below? New media will stretch your thinking and your ability to adapt to change. We also provide some fun and inspiration along the way. Call us for a free quote today. You will be amazed how reasonable we will be.